Thales is set to play a key role in a major U.K. Royal Navy exercise later this year to understand how unmanned systems might add real innovative operational capability in a military maritime environment. Exercise Unmanned Warrior will bring together the Royal Navy and 40 organizations from defense, industry and academia in October, representing the largest exercise of its kind. More than 50 vehicles, sensors and systems from across defense and industry will be deployed the Ministry of Defense exercise centered around the U.K. coast of Scotland and West Wales. As an industry leader in autonomous and unmanned systems, Thales will showcase its capability through the Watchkeeper Unmanned Aircraft System, Halcyon Unmanned Surface Vehicle and its collaborative work in the field of unmanned command and control research. For the first time, Watchkeeper, currently in service with the British Army, will fly in a littoral naval environment operating alongside a Type 23 warship and a merchant vessel. Watchkeeper will be integrated into a series of exercises varying from persistent wide area surveillance support up to 150 kilometers offshore, to landing forces and naval gunfire support. Data collected by Watchkeeper will be streamed down remotely to the vessels and analyzed by trained operators to make better informed command decisions in support of the trials exercises. 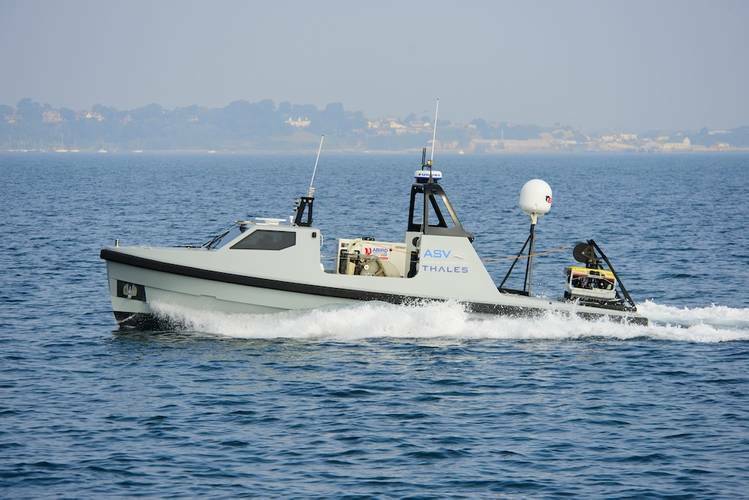 Thales’s Halcyon Unmanned Surface Vehicle (USV), equipped with a Thales Towed Synthetic Aperture Sonar, will take part in a number of mine hunting challenges aimed at demonstrating the significant benefits of autonomous technology when operating in hostile environments, including the reduction of risk to life. 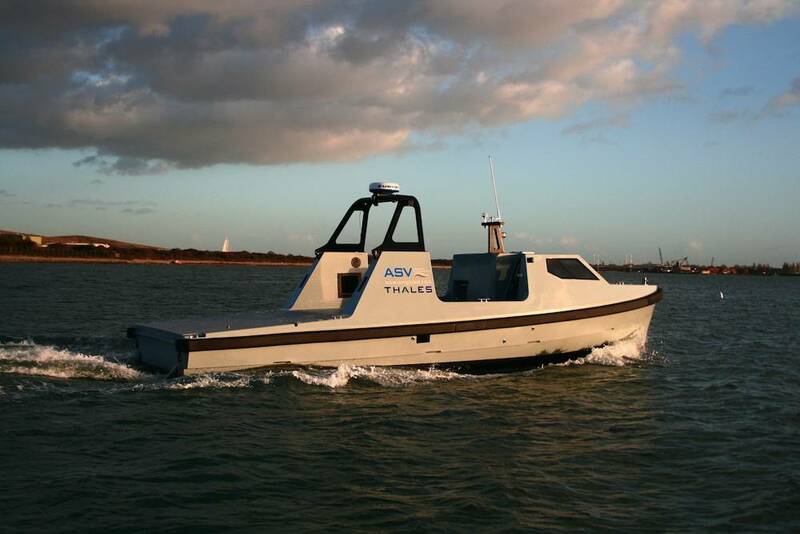 Missions using Halcyon will be planned and coordinated using Thales mission management software, providing comprehensive command and control of the USV operation. Thales is the key sensor provider to the Royal Navy’s existing minehunting fleet through the operationally proven Sonar 2093 and Sonar 2193. Thales, with industry partners is also involved in the U.K.’s Defense Science Technology Laboratory (DSTL) innovative research program called MAPLE (Maritime Autonomous Platform Exploitation). The MAPLE program is developing the future architecture for Unmanned Systems Command and Control, by enabling multiple unmanned platforms, such as unmanned air vehicles (UAV), unmanned surface vehicles and unmanned underwater vehicles (UUV), and their payloads to be innovatively commanded and controlled from a single control station. 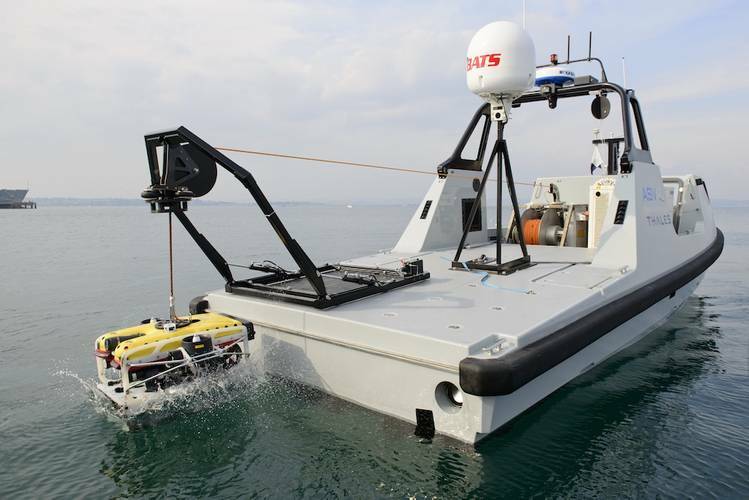 Thales has been instrumental in the design of the multi domain architecture and has brought experience of operating USV, UUV and UAS into the design activity. The MAPLE activity will form a key part of Unmanned Warrior, providing initial implementations of the Unmanned Systems control station, incorporating the Thales mission management software for the seamless command and control of the Halcyon USV.